Located centrally in the United Kingdom, Pentons offer a comprehensive chilled warehousing and distribution service including collection, storage, order-picking, delivery and product invoicing combined with 24/7 office cover we offer the best solution for UK nationwide multi-temperature and ambient warehousing and distribution of food and groceries. Pentons operate in an extremely demanding environment, in which the high quality and hygiene standards associated with the temperature-controlled storage, handling and distribution of food products is matched by the very high standards of temperature control, product shelf life, accurate order fulfilment and on-time deliveries demanded by the major grocery multiple retailers and wholesalers. A commitment to quality, hygiene, delivery, warehousing, vehicle fleet and staff presentation. A commitment to people, Health and Safety, training, and staff development. A commitment to efficiency, productivity and cost-effective distribution, through regular monitoring, with customers, of operational key performance indicators, cost and unit cost performance, and fleet operating statistics. 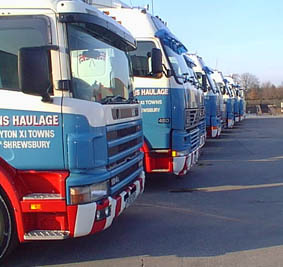 A commitment to Continuous Development - through the introduction of best storage and warehousing practice, modern Information Technology and communications systems, Cellnet phones in all vehicles, vehicle tracking system (Datatrack) and the use of modern vehicles which are maintained to a very high standard. Pentons commitment to each of the above is demonstrated by its customer base which includes a number of major blue chip manufacturers of food products.